Home / Unlabelled / Ready !! Set!! Pedal!!!! 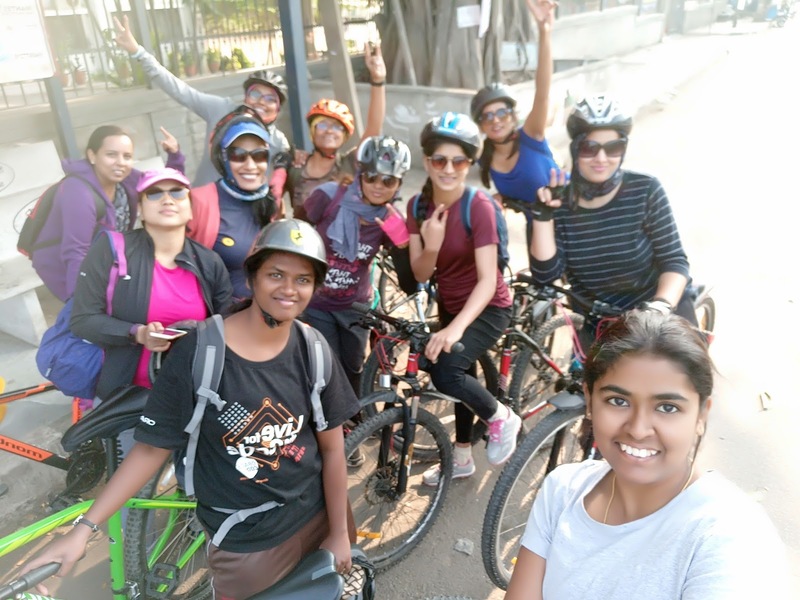 If for Sneha it was a daily routine to commute to office in cycle, for Suma it was a memory of her childhood to rent cycles for riding at an hourly rate of Rs. 1, for Kanchan had completed 50Km cycling event and for me years ago it was riding cycle from entrance of the campus gate to office building where I used to work. But no one can deny the real fun used to be the beginning days of learning cycle or to go to school or that early morning ride to tuitions with your friends. BTC provided us with this excellent opportunity to relive those days by organizing cycling event on their 5th year anniversary. What a fun way to get to ride the bicycle with like mindset WOWies and also learn one or two things also about gear cycles. but never dared to take up their cycling events before, this was a good opportunity for all as no prior cycling experience was required and with WOWies I was sure this will be more fun. When the alarm buzzed at 4.30 AM – for a change it was not to curse the alarm but to jump off from the bed to start for an exciting day. Prepared food for the potluck and booked a cab to reach the venue ‘Hebbal railway station entrance’ at 6.15 AM and joined organizers. It was still dark and cold, cycle vendors were yet to come. 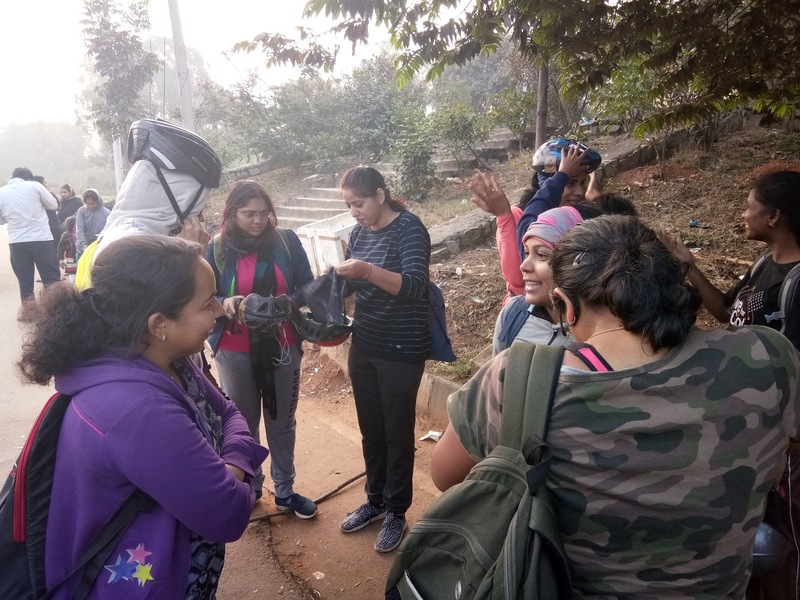 By 7.15 all the participants had joined – Mano, Sneha, Ramya, Divya, Suma G, Suma V, Kanchan, Parimala. We were in the mid of our introduction session, when the omni van came loaded with cycles. 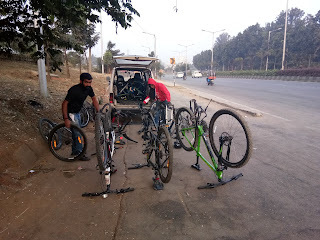 All the cycles were un assembled, Vineetha and Bhanu from “The Garage Café” soon got into work with assembling the cycles. Within sometime all the cycles were ready. But we found all the cycles were considerably big for our height, but later Vineetha assured us that we can ride them with ease once on it. So organizers gave the responsibility of assigning the cycles to Vineetha and Bhanu, since they knew it better to assign cycle as per individual’s height. Parimala and Suma V were given the bigger cycles whereas all the other cycles more or less of the same height was assigned amongst others. Now it was time to learn some basics of gear cycles, how and when to switch them. - Switch to left side shifter to 1 when going up, 2 on normal roads, 3 when going down hill. - Switch the right side shifter to increase or decrease the speed accordingly - ideally to be kept at 3,4,5. By default they kept all the cycles at left shifter at 2, right shifter at 4 mode. Vineetha encouraged us to change the gears and advised to experiment with it for smooth ride. Vineetha and Bhanu assured us that they will be following us throughout the activity and will be there for any help required on the way. They also told that if anyone is tired they can hop in the vehicle, but encouraged us to complete the whole event. With this we started off our 30km cycling event. Shilpa was leading the pack and Bharti was trailing. Initial ride was smooth on flat roads and being Sunday there was not much traffic. After passing underpass the road seemed up way, I tried to switch the gear from 2 to 1 ---wooooh now felt what it really means to ride a gear bicycle, without having to put too much effort to pedal. After pedaling the up way we reached the Gorguntepalya signal. Signal was green and we quickly crossed onto the Tumkur main road, which was now busy by this time. We kept to service road and most of us were damn hungry by this time, we kept pushing as there were no good restaurants on the way.I felt like I was pedaling more but the cycle was not moving at the same speed as the others, so on others advise I kept changing the gears to see what suits me. We joined main road and took right towards Hesaraghatta road at the 8th mile junction on Tumkur Road. This road is very familiar to me until Chikbanavara, with my frequent visit to my relative who stays near here. This time traveling on a familiar path not on a bike or car but on cycle was an amazing experience. We ordered for Idly, Dosas and the breakfast was delicious for the tired souls. Now huffing and puffing all the way uphill came Bharti, Dhanu, Parimala and Kanchan. Then we got to know that Bharti told one of the passersby on the bike to stop Kanchan and Parimala who were very ahead. When the guy reached near Kanchan he asked them to stop, but Kanchan overcome by stranger anxiety on an unknown road yelled back at him saying “Why should they stop”. Now imagine the poor guy’s state for asking them to stop. We had a good ROFL moment when Bharti narrated this story. Well – thanks Parimala and Kanchan for this hilarious moment. After fueling ourselves with food and tea we headed towards Chikabanavara. Ride after Chikbanavara was very gentle on a single road covered by trees on both sides and shade throughout the way. We reached Hesaraghatta and took a right towards the lake.There is a big arch at the entrance which leads to some steps.Bhanu told us get our cycles over the steps to top for a good view and clicks. Currently there is sufficient water in the lake. This man-made lake was built by the erstwhile Chief Engineer of Mysore M.C. Hutchins, is counted amongst the largest artificially designed fresh water reservoirs. The lake is fed by waters from the Arkavathi River that originates from the Nandi Hills of Kolar District. Vineetha served us all smoothie, it was awesome but we all failed to guess the ingredients of it. She later revealed it had watermelon and vanilla ice cream. Bharti was hurrying us up to get over with photo session since we had to go further to Nrityagram. This place closes by sharp 2 PM. We got our cycles off the step and took road towards Nrityagram. Road is under construction so pedaling was little difficult on this rough terrain road. We came across some of the organizations like research and development farms for poultry, animal husbandry, agriculture and horticulture, Adarsh film institute on the way. We came now on tarred roads and again with the farms spread across on either side of the road, it was a very good experience to pedal through the way.We reached Nrityagram around 1PM , with hardly one hour left we still decided to take the tickets. Fortunately dance class was still going on and we went directly to the class. We witnessed an amazing odiya dance, though it was almost towards the end we all were absorbed by those swift yet graceful and precise moves of the dancers. It was a blissful experience to watch the dance. Photography is strictly prohibited in the area, so we could not capture anything here. Bharti later talked to the dance guru and she was happy to see women cyclists come all the way till Nrityagram. After the dance class closed, staff gave us a quick introduction on the Nrityagram and asked us explore the place and return by 2PM. It was 2.10 PM when we exited the gates of Nrityagram and we were all damn hungry now. We took out our lunch packs and shared our food. After lunch we started towards Hesaraghatta main road where the next plan was to get bus towards main Majestic Bus stand. But the ride down was awesome as we did not have to pedal much and reached Hesaraghatta main road. 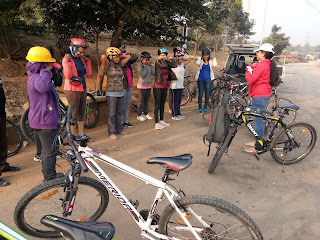 After handing over the cycles and saying our goodbyes to Vineetha and Bhanu we boarded the bus towards Majestic bus stand. 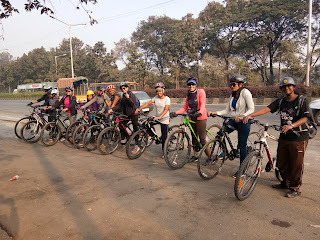 We had quick feedback session in the bus and said our thanks to Bharti and Shilpa for organizing first WOW cycling event from BTC. Most of us pedaled after a long time and we never gave up along this 30+km cycling even when the legs felt like logs and refused to pedal or when the hands went numb by exerting all the upper body weight on the cycle handle. We were all very proud at the end of the event. A big thanks to all the co-cyclists, organizers Bharti and Shilpa, The Garage café and BTC Admin. The warmth, the friendliness of each one of you is cherish able.